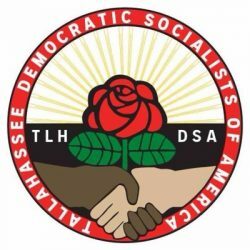 DSA members that reside within the Tallahassee metropolitan area (Leon, Gadsden, Jefferson, Wakulla) are automatically part of the TLH DSA local chapter. DSA is a dues paying membership organization. Yearly dues are on a sliding scale ($20+) and paid directly to national via their website. Once you have joined the Democratic Socialists of America, please forward a copy of your electronic receipt to TLHDSA@gmail.com so that we can get you hooked up with the Local ASAP!